Recently, I wrote a comprehensive post that compared and contrasted the following 4 email services. And in that article, I revealed that I had recently switched over to Drip for MyWifeQuitHerJob.com. But no sooner than 10 minutes after I hit “publish”, I became inundated with emails from my readers. Steve, I thought you used Klaviyo. When did you switch? Steve, isn’t Klaviyo your sponsor? Why are you promoting a company you don’t use? Steve, I just signed up for Klaviyo on your recommendation and I feel a little mislead. So today, I’m going to clear things up once and for all. 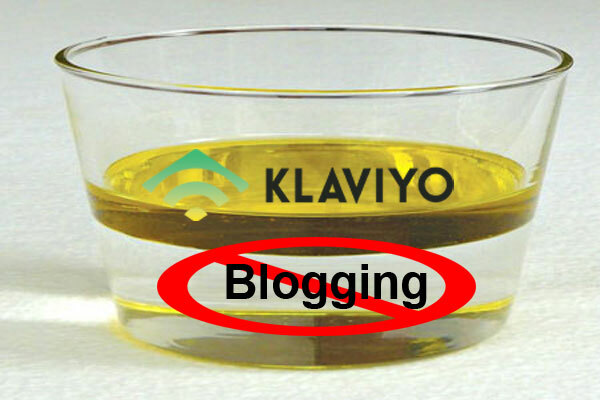 Right now, I’m using Klaviyo for my ecommerce store and Drip for my blog. In addition, I will explain the difference between the two services and why one is better suited for ecommerce vs blogging. Most ecommerce store owners sell multiple products. For example, Bumblebee Linens has over 480 SKUs spread out across multiple product categories. One of the main strengths of Klaviyo is the ability to track the sales of every single product in your store so you can create specific customer segments at the push of a button. In the example below, I created separate lists based on the products customers purchased from our store in the last 30 days. When a customer buys hankies from us, we send them handkerchief specific campaigns. When someone buys dinner napkins, we cross sell them tea and cocktail napkins. All of this purchase tracking functionality is built in right out of the box and you don’t have to do ANY work to set it up. Basically, you click a button and Klaviyo tracks everything automatically. Note: Klaviyo has push button compatibility with Shopify, Big Commerce and many other shopping carts. The best part is that there’s full revenue tracking on every single email sent. As a result, you can send out an email and instantly know how much money you made from that campaign. Once again, you don’t have to do any work to set this up. It’s built in out of the box. Now if you were to use Drip for your ecommerce store, you might be able to replicate Klaviyo’s functionality but you would have to code everything up yourself. Editor’s Note (Nov 2018): Drip has added a lot of ecommerce functionality in the past year. I would estimate that they have 80% of Klaviyo’s capability at this point. I will do a full review soon. There is no push button integration between Drip and your shopping cart. If you want to track a specific product, you have to do it manually. The other reason I use Klaviyo for Bumblebee Linens is because its autoresponders are specifically tailored to ecommerce business owners. Upon the creation of a brand new account, Klaviyo presents you with a bunch of pre written ecommerce email autoresponders that are ready to go. All you need to do is modify them slightly with your own brand messaging. I go over all of these autoresponders in depth in my post on 5 Email Autoresponders Your Online Store Needs To Automate Sales. Customer Winback Autoresponder – Customers who purchased from you in the past but haven’t purchased in a long time can be reminded to come back to shop. Cross Sell Autoresponder– Use this sequence to introduce customers to other related products in your store and increase sales. The best part about Klaviyo is that it can pull images and product descriptions directly from your catalog. For example, when I send out an abandoned cart email, I display images of the exact products that are in the customers shopping cart. As far as I know, you can not do this in Drip or any other generic email marketing platform. Because Klaviyo stores all of your customer data as well as their purchase information, you can implement some fairly sophisticated rules with your emails. For example let’s say you want to create an autoresponder sequence to provide the customer with a coupon if and only if they are a brand new customer. This is a piece of cake. In the image below, I’ve set up a coupon in my pre purchase sequence that only goes out the customers who have “placed 0 orders over all time”. The number of options that Klaviyo offers is pretty insane and you can pretty much do anything you want because all of your data is at your disposal. Once again, you can’t really do this in Drip. There is no concept of segmenting based on product or revenue (without manual instrumentation). You can’t pull your product catalog in either. Klaviyo’s Facebook audience integration could perhaps be the most valuable feature of all. 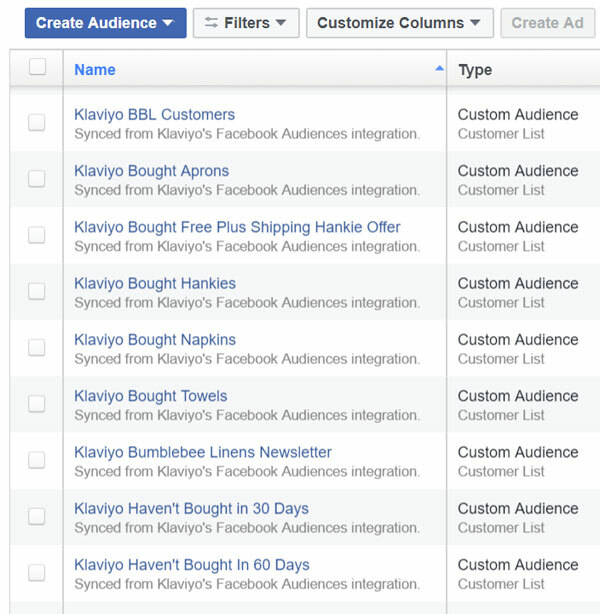 Basically, Klaviyo can automatically create and maintain Facebook custom audiences based on your customer data. Now why is this powerful? Basically, I can synchonize my Facebook ads with my email campaigns! Let’s say I just sent out a coupon code to my best customers. 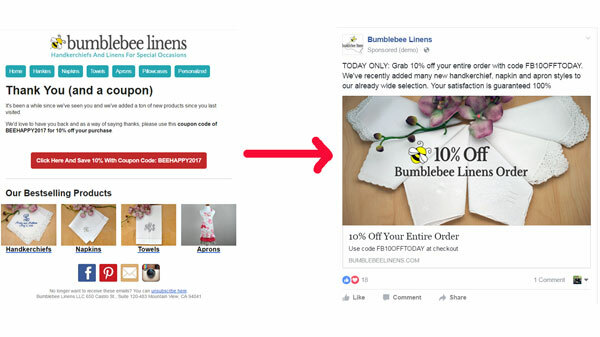 By exporting a Facebook custom audience of the exact people who received that email, I can create an identical Facebook ad offering that same discount! Remember my abandoned cart sequence? 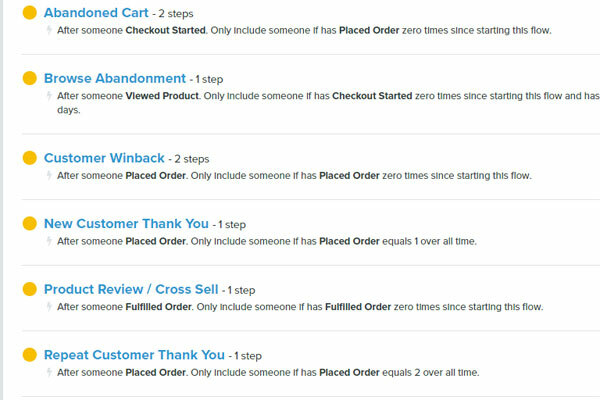 Every time I send out an abandoned cart email, I can also automatically run an abandoned cart Facebook ad campaign. Everything is set it and forget it and it ensures that you are reaching as many customers that you can with your marketing messages. Now that you’ve seen how powerful Klaviyo is, you’re probably wondering why I don’t run MyWifeQuitHerJob.com on Klaviyo as well. 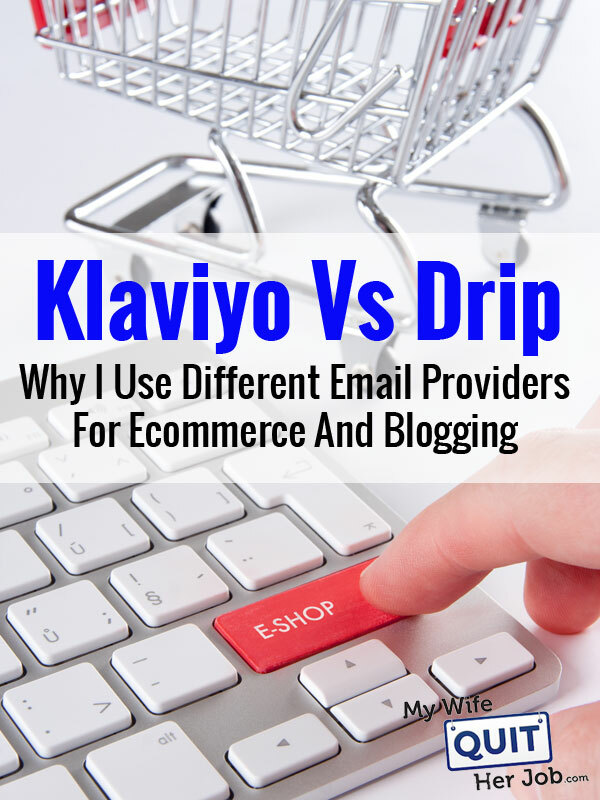 First off, Klaviyo is about 3X more expensive than Drip. 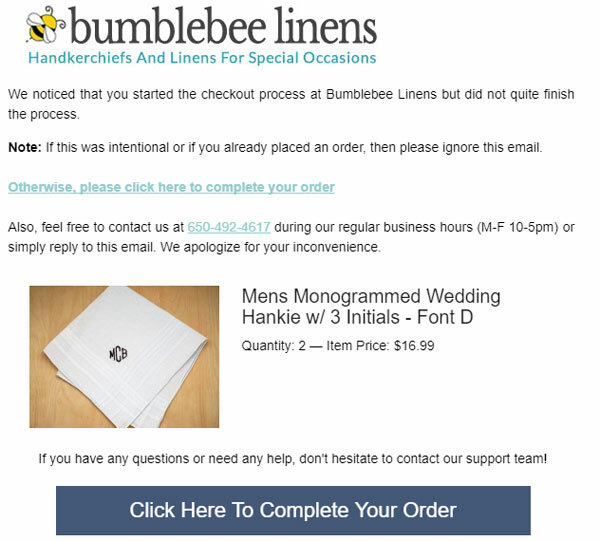 Currently my revenue per email is much higher with my ecommerce store than with my blog because every email I send for Bumblebee Linens directly results in sales. However with MyWifeQuitHerJob.com, most of my emails are used to drive traffic to my content so it doesn’t make sense to pay more than I need to pay. In addition, Drip has many features designed for bloggers that Klaviyo doesn’t have. For example, Klaviyo does not have a concept of tagging based on arbitrary parameters. I can’t easily create custom tags for my email list outside of their purchase behavior. In addition, the click to tag functionality that I require for webinars is not supported by Klaviyo. As a result, I can’t segment my subscribers based on their interests within an email. It’s also not straightforward to segment a customer based on which web pages they looked at on my site. Finally, you can’t perform complex automations with Klaviyo. For example with Klaviyo, I can’t move a subscriber back and forth across different email autoresponders based on their click behavior. In short, the reason I use different email marketing services for my various businesses is because each business has different needs. For my blog, it’s important for me to segment my list based on interest. Because I write about many different topics on MyWifeQuitHerJob.com, I need to know which subscriber is better suited to certain types of content. But for my online store, it’s all about putting the right products in front of the right people. It’s all about sending the right emails based on what they purchased or looked at across more than 480 SKUs. Until there’s a one size fits all solution that is similarly priced, I will continue to use 2 different services for my email. Thanks for the clarification! I’ve used Klaviyo for an ecommerce store and loved it except for the lack of tagging and ability to easily add someone to a flow. I also run a blog and have used Active Campaign to help with the tagging and automation but sorely miss the revenue tracking on emails. Great post! really liked this in-depth comparison of both supporting tools. thanks for this Steve! Is this out of date? Drip calls itself an ecommerce CRM, so it sounds like they are now made especially for ecommerce. I’m torn on these two–I’m launching a single product brand so I don’t really need product segmentation, but I would like to know customer ASP, order frequency etc. I’m leaning towards Klayvio only because it seems more focused on sales/revenue behaviors. Do you think I’m on the right track?